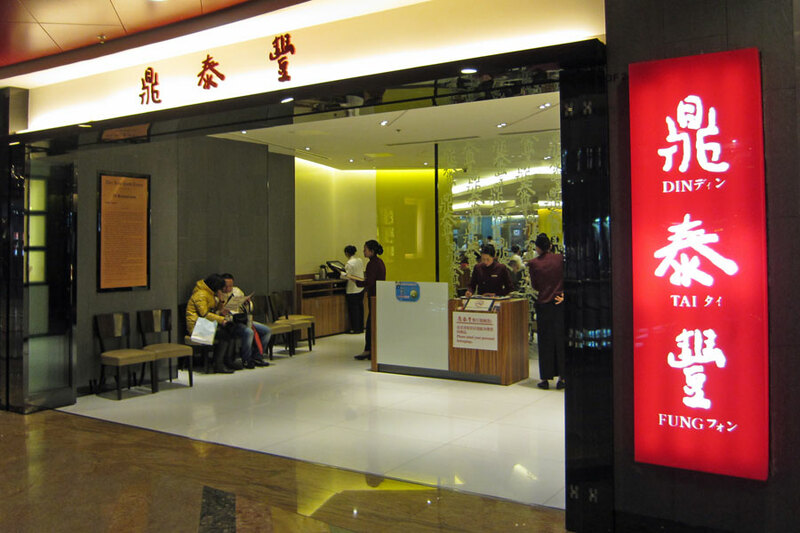 Din Tai Fung is a Taiwanese restaurant chain, but their xiao long bao is legendary. 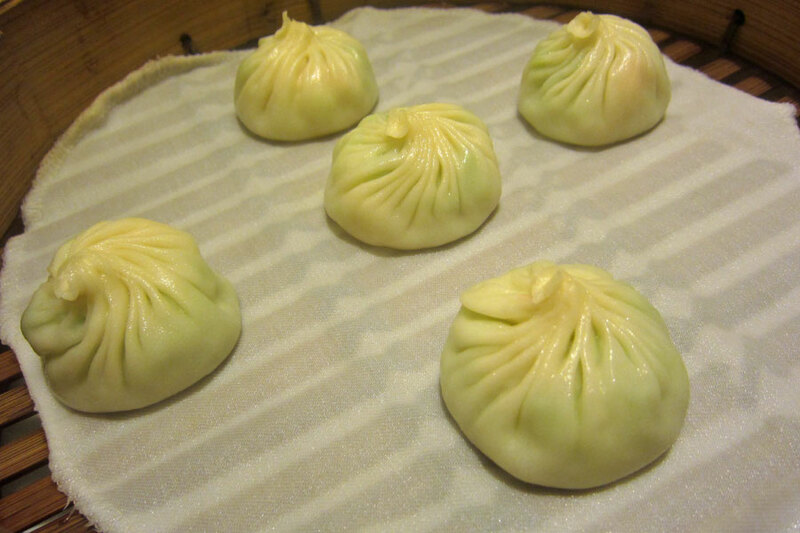 My godfather swears by it and he thinks that it’s one of the best places to have xiao long bao in the world. So naturally I just have to pay a visit to one of the branches as soon as I got off the plane in Shanghai – and it’s the branch in the Super Brand Mall in Pudong that I visited. Goose Liver and Chicken Xiao Long Bao, and Crab Meat and Pork Xiao Long Bao – Both were delicious and better than Minjiang restaurant in London (which should be the case anyway, even though Minjiang does do a mean xiao long bao) as there was less gelatine texture in the soup base inside the dumplings. 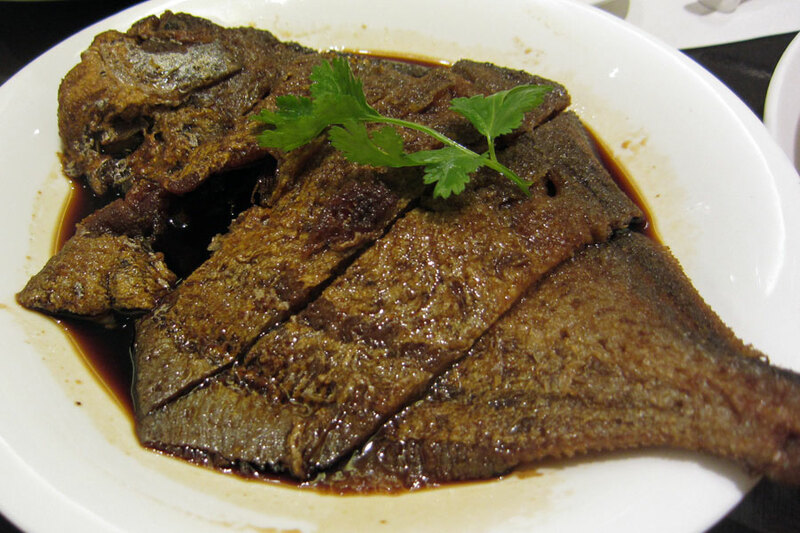 We also ordered two of the classic Shanghainese starters: Drunken Chicken which had a nice balance of meat and alcohol flavours; and Smoked Fish which was swimming in a rather sweet sauce. 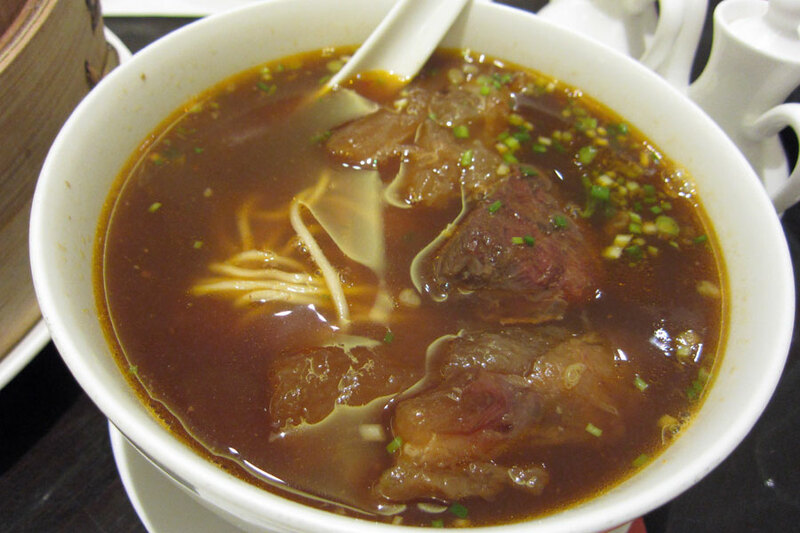 The beef brisket with noodles soup was good standard fare – nothing spectacular, just comfort food for me. 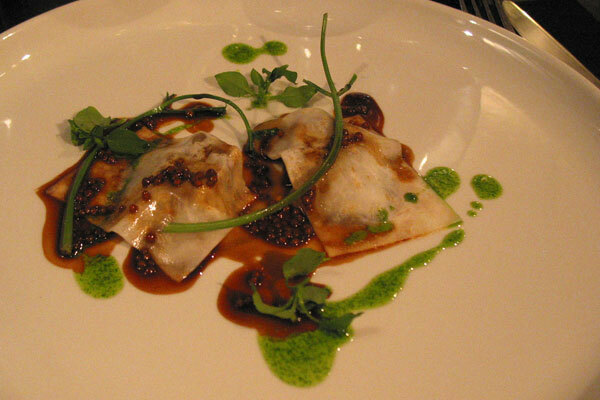 The Crab meat and roe with Pea Shoots was a nice dish, though it was verging on the very expensive side. 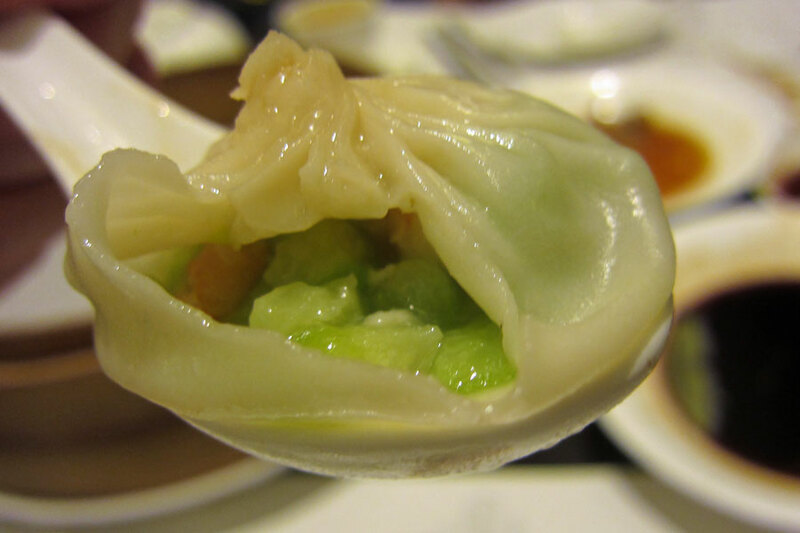 Fortunately none of the dishes were too large, and so we manage to find some more space in the stomach for the Soft gourd and Shrimp Xiao Long Bao. 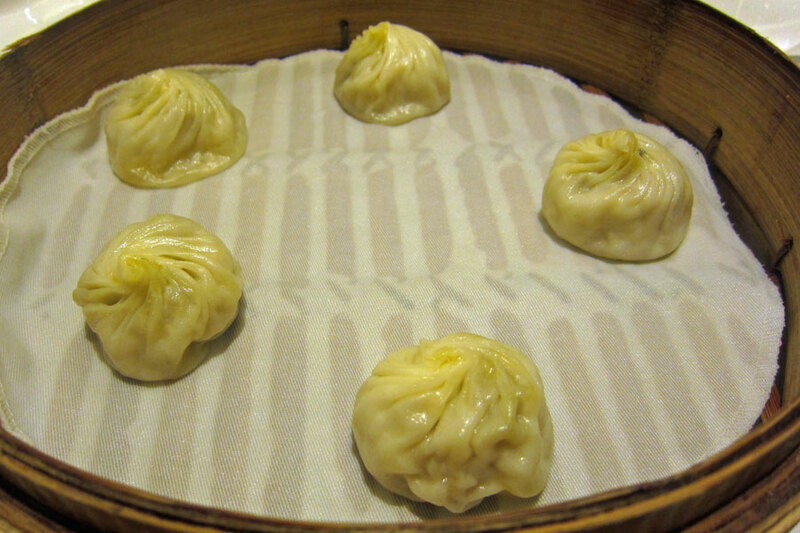 They had less intense flavour than the other xiao long bao we had earlier, but they were more refreshing and certainly not a filling that I had come across before. It was a nice way to finish the meal. 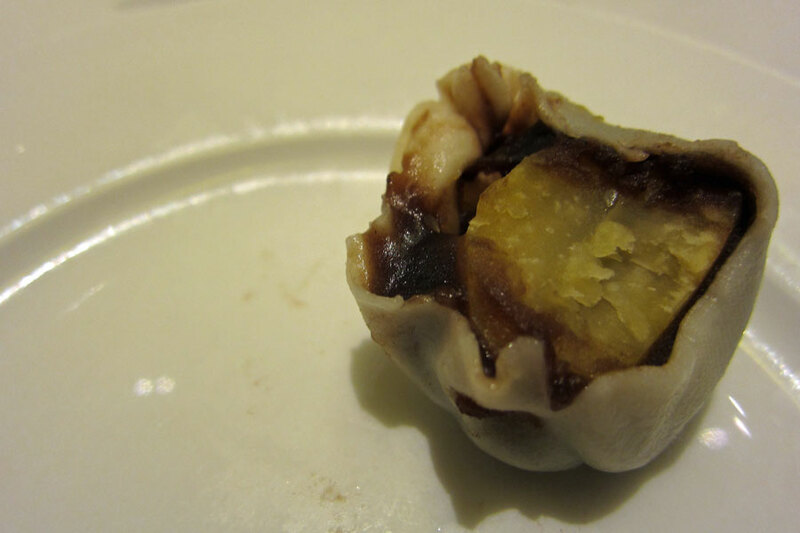 Even though by this point we were quite full, I just couldn’t bear the thought of missing out on the dessert, especially because it was Red Bean Paste and Chestnut Xiao Long Bao – two of my favourite ingredients in a xiao long bao. They were very different in the sense that there was no soup base in the dumplings to deal with. They were not too sweet and I really enjoyed them, though probably more for the novelty value. On the whole, it was a very enjoyable dinner. The very informal setting makes it a perfect place to go out with friends and family for a relaxed meal. 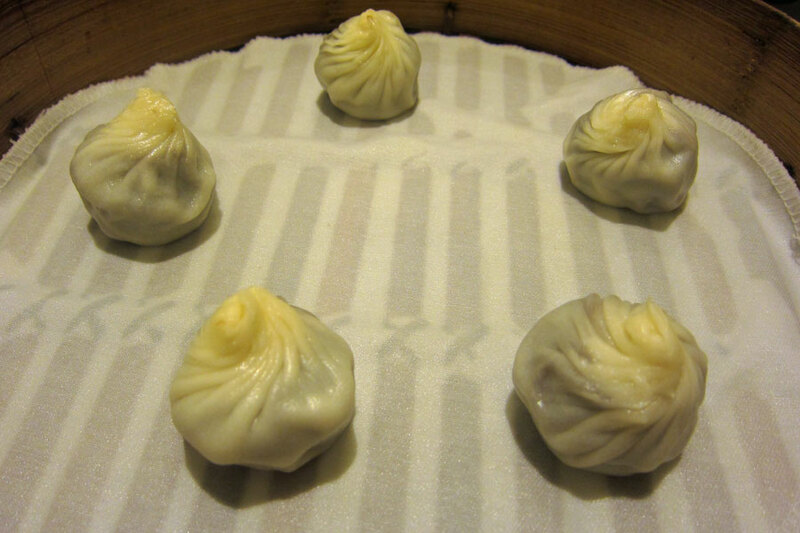 Is Din Tai Fung’s xiao long bao the best in the world? 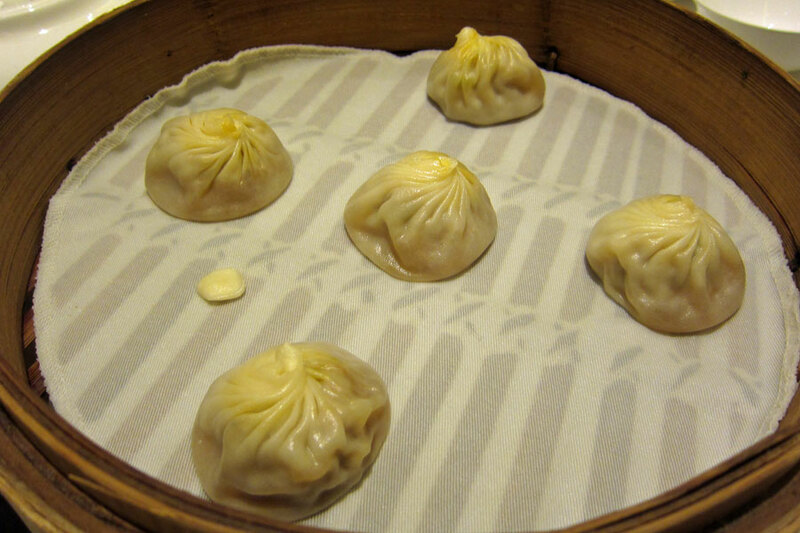 That’s a matter of opinion – personally after this visit I have managed to sample some other xiao long bao that are better. 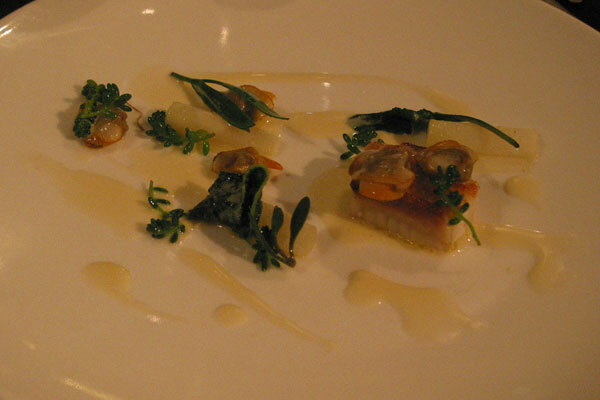 It’s pure coincidence that I returned to L’Enclume exactly one year after the last visit in 2010. It just seemed to be a perfect half-way point to stop over for the night before heading up to Scotland from London. 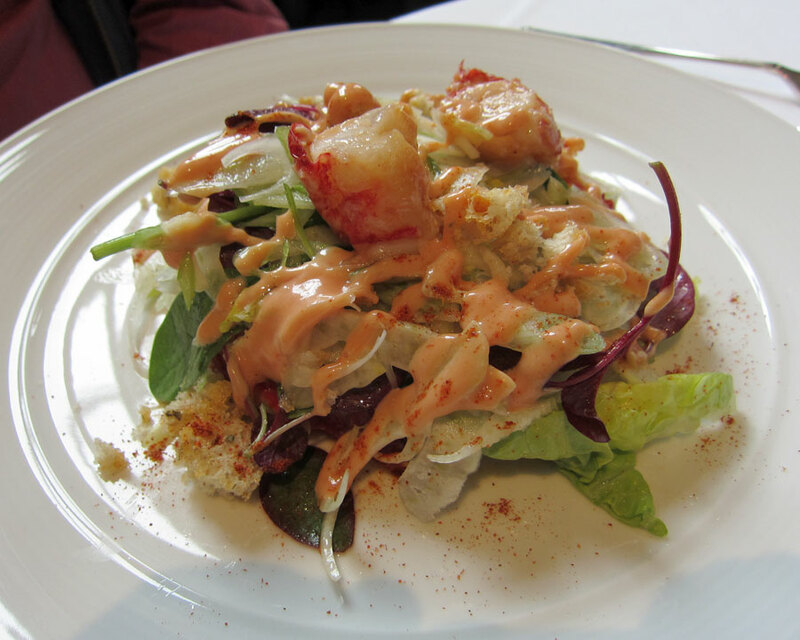 The menu has changed so much in one year – is it good news or bad news? Well, it’s bad news for me in the sense that I had to decide whether to go for the 8-course or 12-course menu, or even opt for the new vegetarian menu. 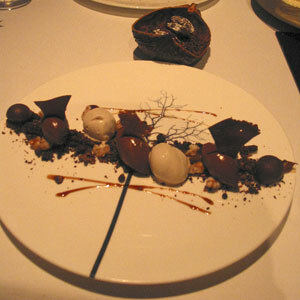 However, it’s good news that even by choosing the 12-course menu again, the dishes would all be different. So it’s like a brand new dining experience again. 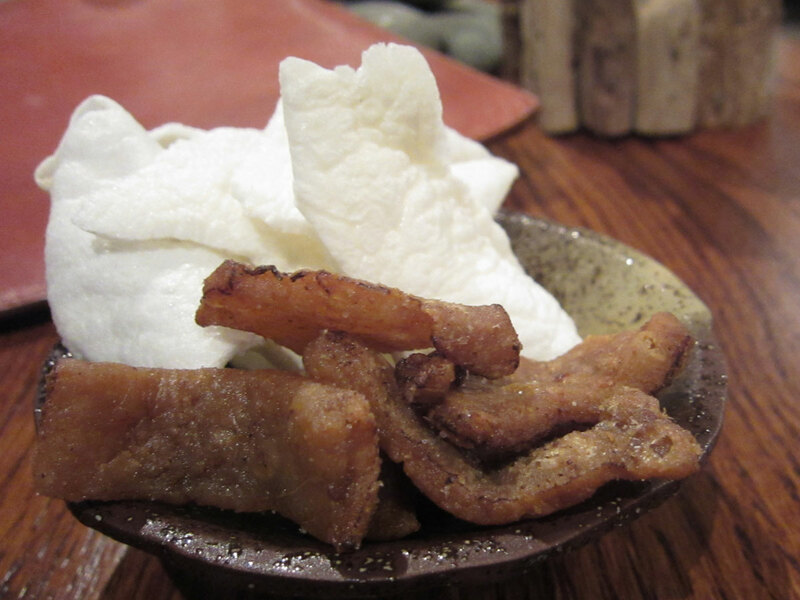 Once we’ve got the champagne ordered, the snack was brought to us: Duck crackling & duck skin crackling. OK, it was not the healthiest thing on earth, but then it was delicious, and I would happily trade part of my health in for the enjoyment of my taste buds. (a) Smoked mackeral with cream cheese and garlic leaves – although all the ingredients came in a small mouthful of pastry cup, I could taste all the individual ingredients, and then the flavours all blended together nicely in the mouth, with a spicy kick of the raw garlic at the end. 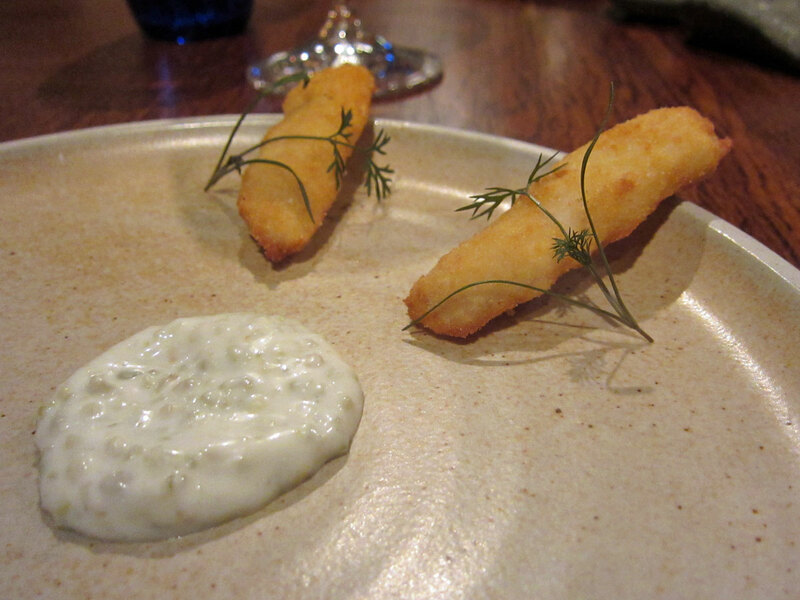 (b) Mayonnaise with fried cod tongue – It was a nice quality piece of fish, though at one point it reminded me of McDonald’s filet-o-fish (still no idea why that would be the case – the quality couldn’t have been further apart) – perhaps I would not have dreamt up this unfortunate association if the batter was slightly finer. (1) Beetroot and mozzarella, celery and dill – there were layers of surprises as you dug deeper into it – all the contrast of textures and flavours, finishing with a sweet beetroot flavour with a vibrant colour at the bottom. 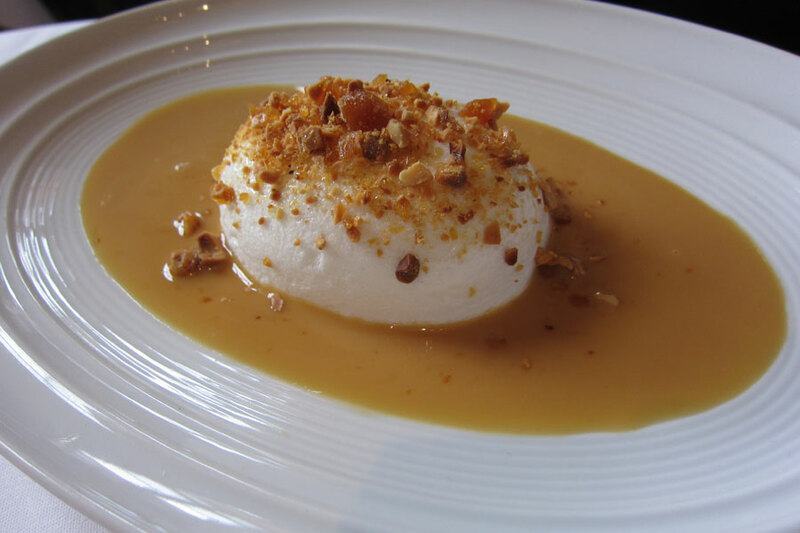 (2) Caramelised parsnip with mousse of meadowsweet, duck sweetbread and black mustard – the sweetbread was fried beautifully and worked well with the parsnip, give a sweet flavour with the mousse. 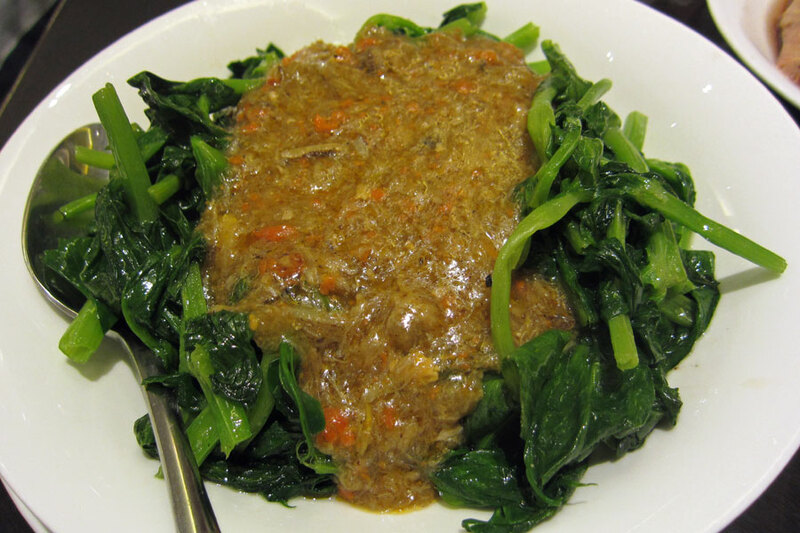 The black cabbage leaves, while giving the whole dish an extra dimension of the flavour at the time, were rather too strong and there was a lingering bitter taste in the mouth well after I finished eating. (4) Marinated scallop, toasted seeds, red cabbage and wild sorrel – I usually love dishes with contrast of taste and texture: while this dish offered a mix of soft scallops and “a bed of” crumbling mix of toasted seeds, with a red cabbage sauce, this dish was not something I liked too much as I find the texture of the seeds actually too hard for the scallops – a bit like biting on sand. 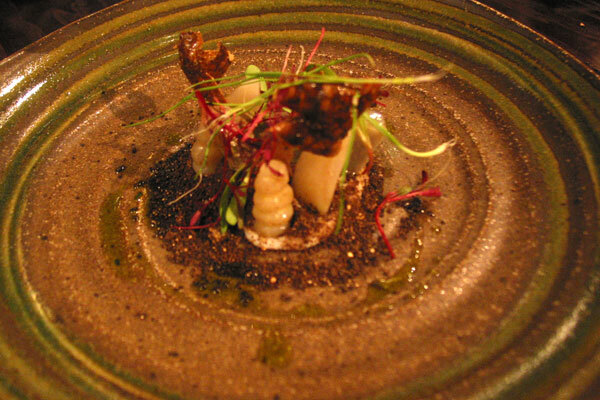 (5) Jerusalem artichokes, Ragstone cream, tarragon, malt – This dish had a good balance of the strong malt taste, and a clean moorish texture of the Jerusalem artichoke. 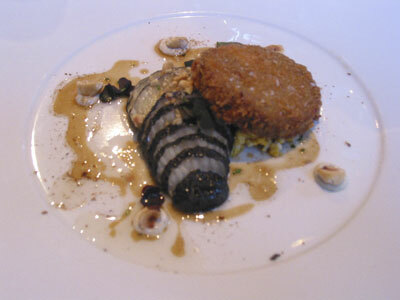 (6) Roasted snow crown with young squid and elderberry vinegar – the snow crown was cauliflower “on a bed of squid ink”. 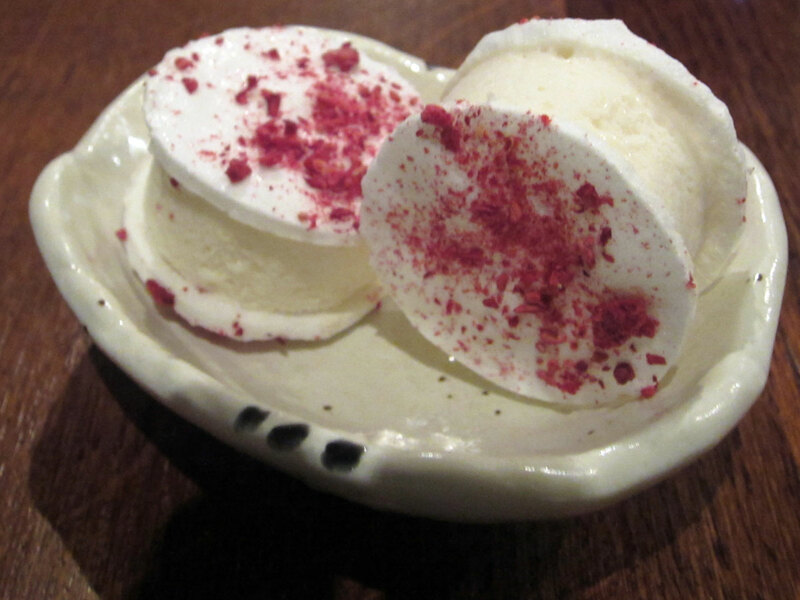 For some reasons L’Enclume really loved using the phrase “on a bed of….” to describe their dishes, and it became a bit of a running joke with my friends. 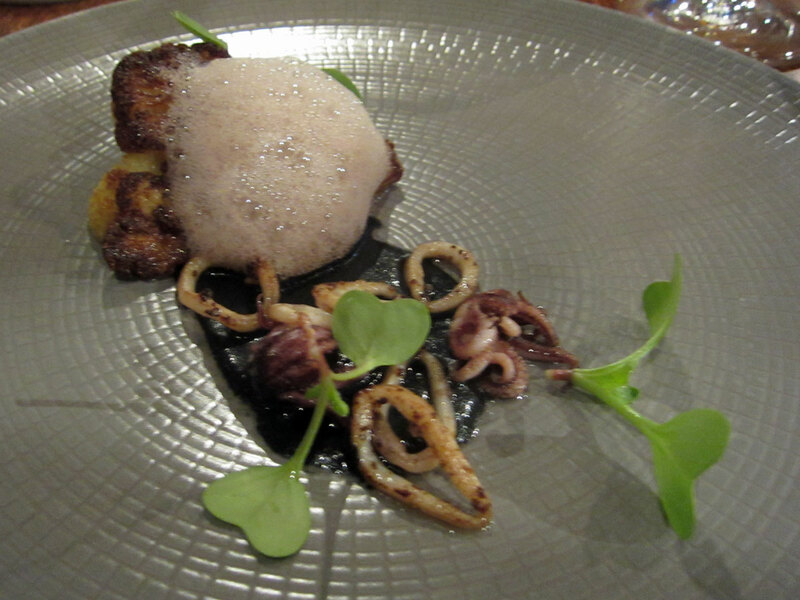 Still, this was a very impressive dish, with the rather soft and bland cauliflower contrasting with the squid, mixing in with the more salty flavour of the squid ink – this combination really worked well. 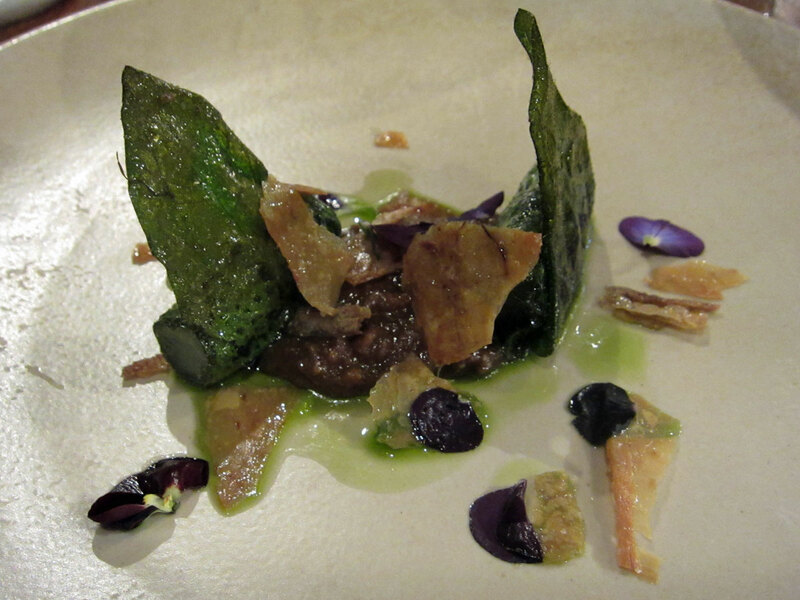 (7) Kohlrabi baked in salt, parsley, chicken offal, bristly ox tongue – I found the chicken offal very greasy and salty, to the point that the dish became a bit too heavy for a 12-course meal. 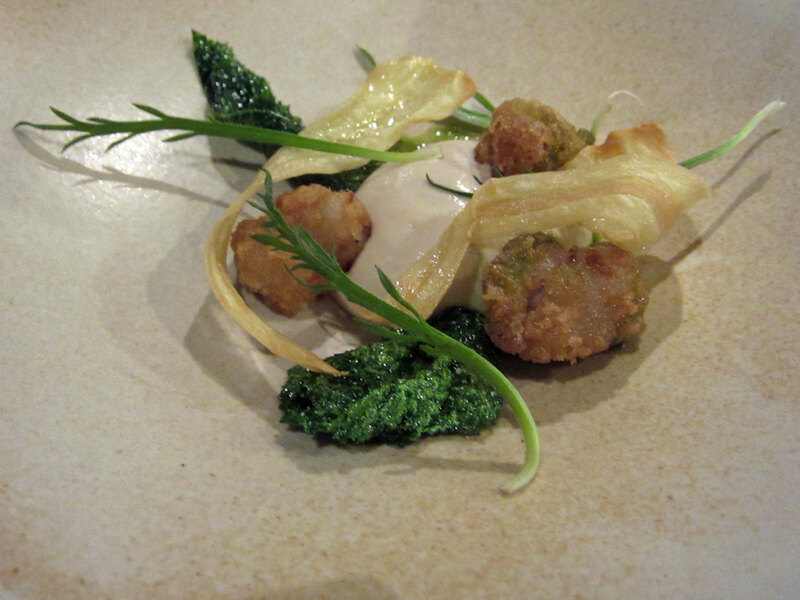 The kohlrabi did help to neutralise that greasiness and gave the dish the much needed breadth of freshness. 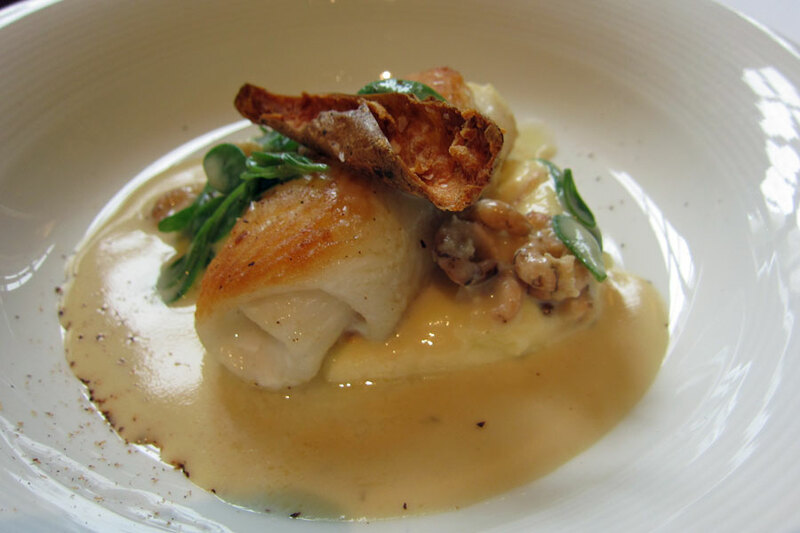 (8) Roasted monkfish in our spices, chervil root and wild watercress – the monkfish was slightly overcooked and on the dry side, but nevertheless had a nice taste. 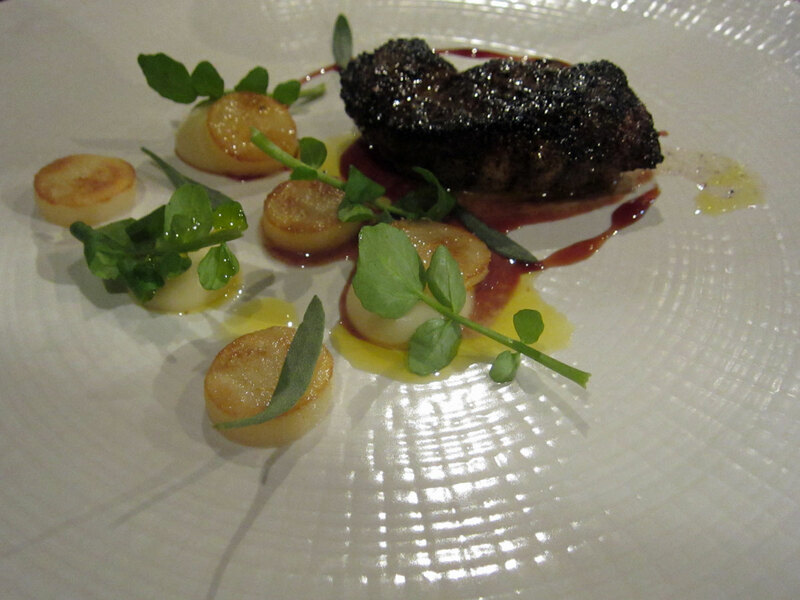 The raspberry coulis gave the dish a pleasantly sweet flavour in addition to the parsnip puree. 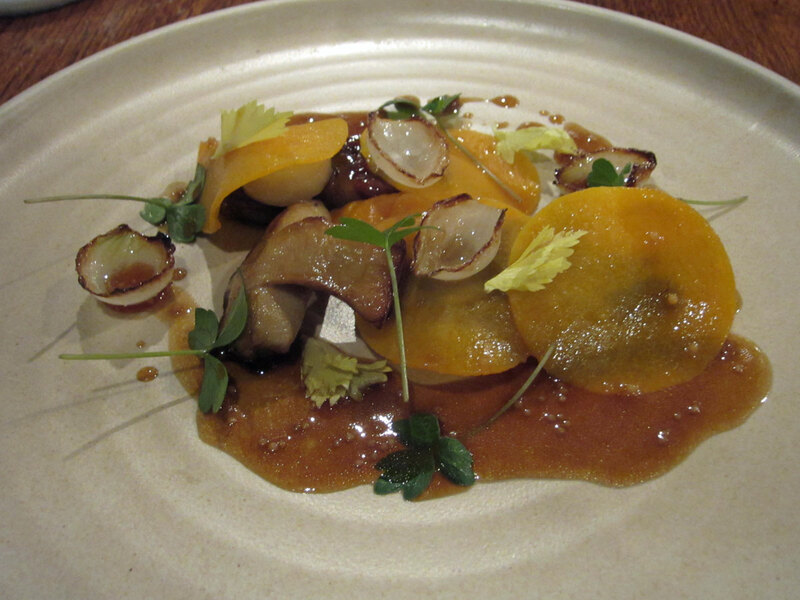 (9) Shorthorn short ribs cooked for 72 hours, smoked marrow and butternut – Instead of the hogget, I requested to have the short ribs from the 8-course menu. The piece of beef was very tender, and that was not surprising considering that it was cooked in a waterbath for 72 hours. I could cut into the meat with minimal effort, and it just melted in the mouth. The sauce was rich in flavour, and the presentation of the dish was sensational with the various colours – I was glad to have opted for this, even though I was struggling with finishing this dish because my stomach felt rather heavy and full, probably due to the lingering effect of the rather greasy chicken offals earlier. 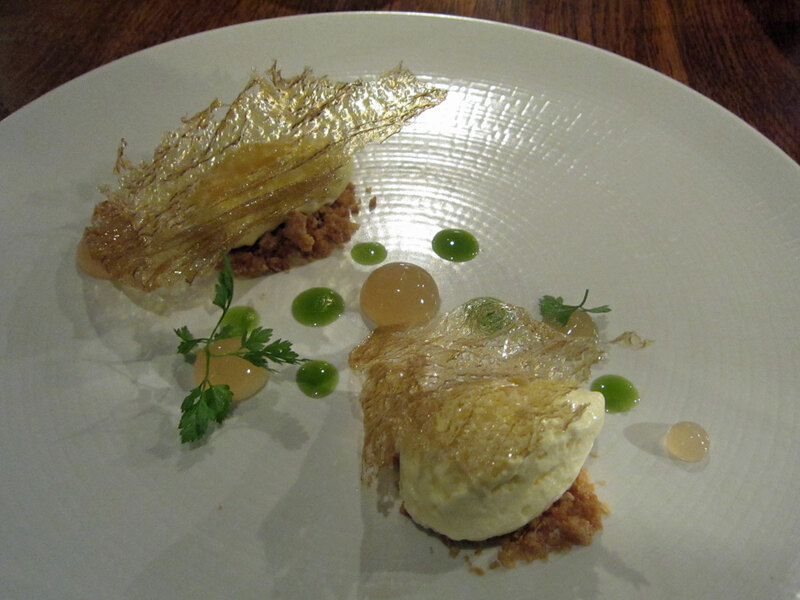 (10) Chestnut, honeyoats, anise hyssop, apple – this was a rather refreshing and light ice-cream. 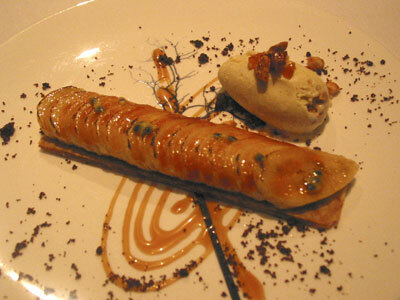 A very welcoming dish to come down from the heaviness of the last few savoury courses. 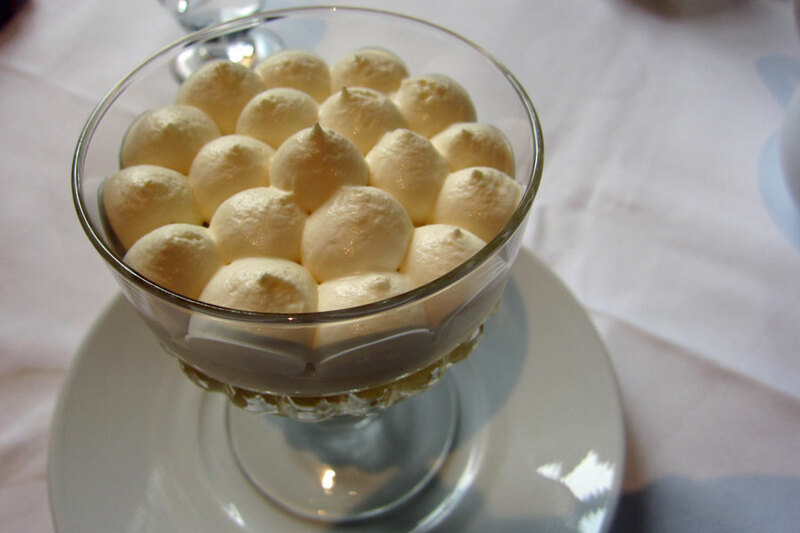 (11) Fig and malted cream, Williams pear ice – the first mouthful of the pear granita was very cold, but as my mouth got over the initial shock the various ingredients worked really well together. The whole dessert was not too sweet either, and I could easily have another one. 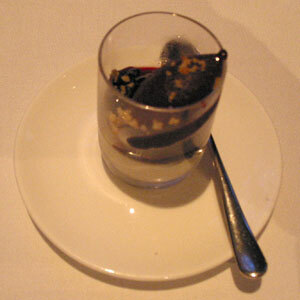 (12) Mellilot yoghurt with nuts, Cartmel grapes, brown sugar – another very deliciously light dessert. It just seemed unbelieveable that there would be locally-grown grapes even if they were grown in green houses, as the November evening just seemed so cold to even think about the area getting warm in the summer. I was glad when the 12th course ended, and I couldn’t even consider having any tea or coffee afterwards. Still, the staff brought over the tiny ice-cream sandwich for us to finish the meal with. I left the restaurant with my stomach feeling rather bloated and heavy like a lead balloon, a contrast to the year before when I felt that I had eaten a lot without this less-than-pleasant feeling. Still, the meal was nice and I was glad to have returned to sample a whole new array of dishes. With a sister restaurant Roganic opened in London earlier this year, there’s always bound to be comparisons – for me, I actually prefer Roganic (with the added bonus that it’s in London rather than 300 miles away in Cumbria). Sometimes it’s a matter of luck when it comes to travel – Darcy, Bob, Russell and I were on our tour round the north of England in the latter half of November 2010, and we could have easily got caught in the snowstorm that swept across the whole of UK, thus putting a damper on our travel plan that had been in place since the summer. Fortunately we managed to be one day ahead of the snow, which meant that we managed to traverse across the Yorkshire Dales from Harrogate to the Lake District without any problem, despite the snow started to come down rather heavily in the morning in Harrogate while we were having our full breakfast at Bettys. Although it was not difficult to find Cartmel, relying on the GPS to find L’Enclume, esp in the dark, was a bit more challenging. Finally I had to give up searching for it in the cold winter evening, and asked a local resident for directions. We got to L’Enclume, settled in the rather interesting and quirky rooms (the floor was sloping, so it’s as if we were already a bit drunk before we had any alcohol), and then we sipped some champagne (we were not celebrating anything – the bottle was just there in the room to welcome us) before heading to the restaurant for the dinner that we were so looking forward to. 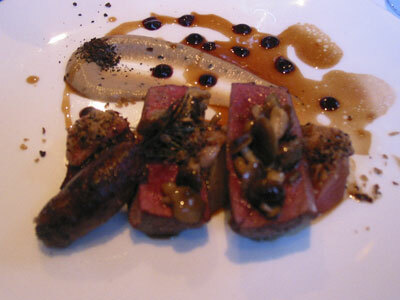 There were two menus on offer, a shorter 8-course menu and a longer 12-course menu. It didn’t really take us long to debate which one we should go for – of course the longer menu! 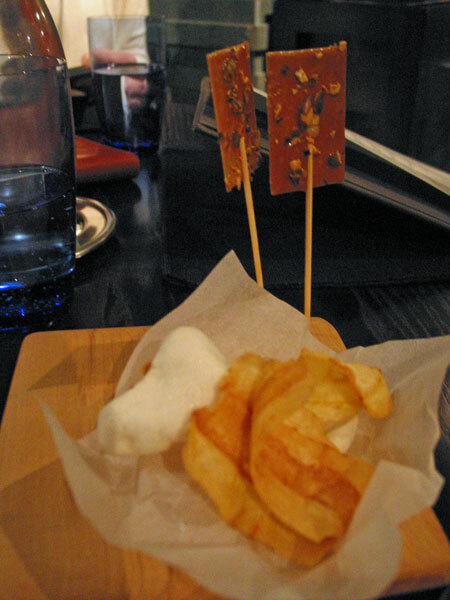 Pumpkin seed lolly with parsnip crisp were brought out to accompany the bottle of Montagny premier cru that we had chosen. 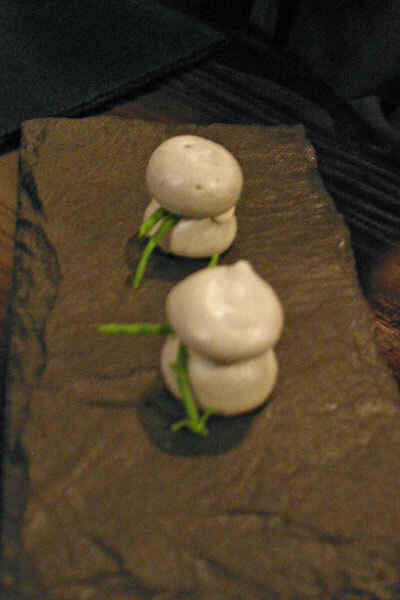 The amuse bouche was apple macaron with oyster mousse and samphire. It had a nice blend of taste, accented by the sweet apple flavour. 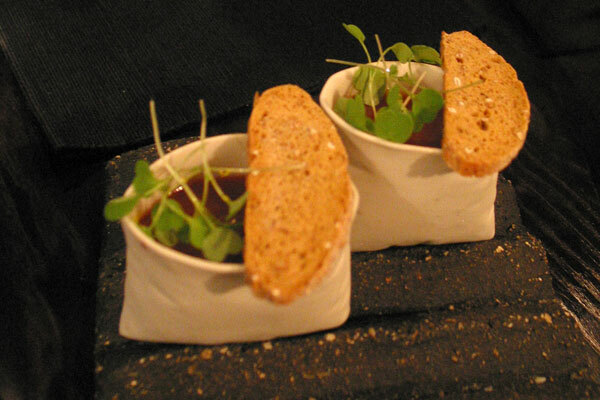 The first course was Cumberland sauce jelly and butternut squash, blood sausage, rocket and sour rye toast. It was a sophisticated dish, with a spectrum of flavours ranging from the intense sweetness of the cumberland jelly, then the smoothness of the butternut squash and savoury blood sausage. 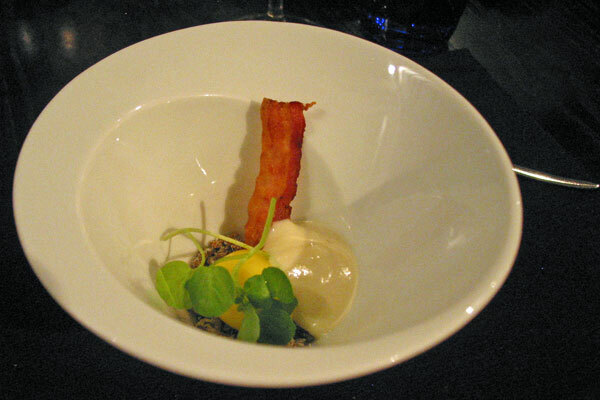 The 2nd course was salt and vinegar crispy rice and cod ‘yolk’, bacon, watercress, cream of egg and garlic. At first taste, I found the dish rather plain, but every subsequent mouthful it just grew on me, and by the time I finished the dish, I just wanted another one. Bob described the dish as “breakfast in a bowl” while Darcy who didn’t like mayonnaise commented that there’s finally a mayonnaise that she could eat! 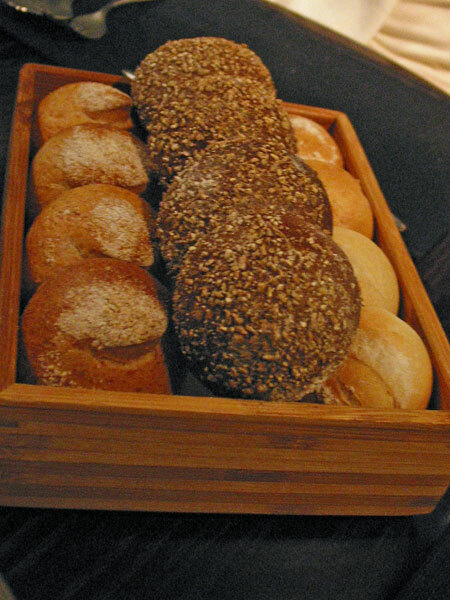 There were three choices of bread: white flour bread, pumpernickel and molasses in the middle, and the spelt bread on the right. 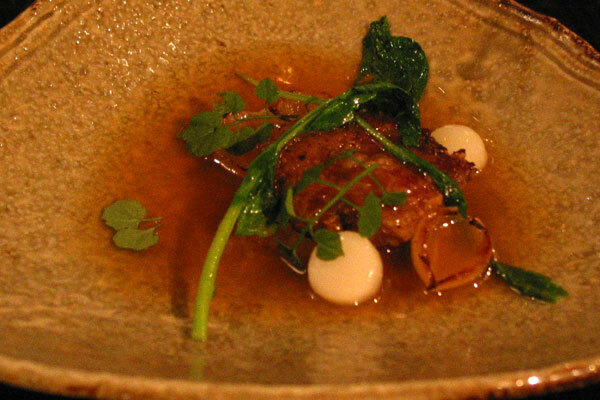 The next course was turnip root and stems, Reg’s duck wing, vegetable juices with juniper. 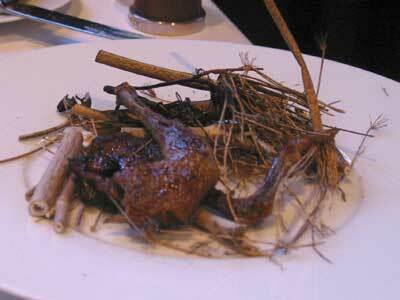 The sauce had an excellent flavour, though the duck was a bit on the salty side. 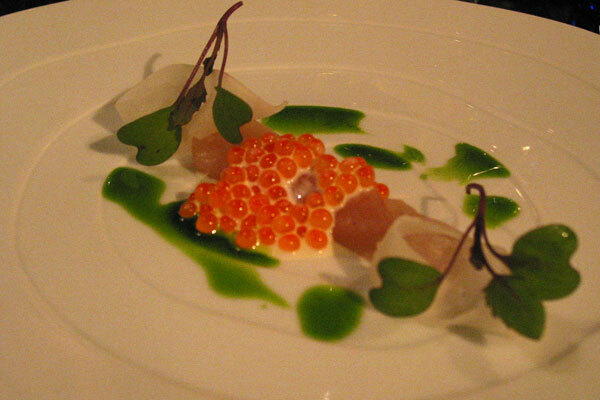 The 4th course was lightly smoked Arctic charr, pickled white radish, parsley and fresh salmon roe – the orange colour of the roe versus the green leaves and sauce looked absolutely stunning. 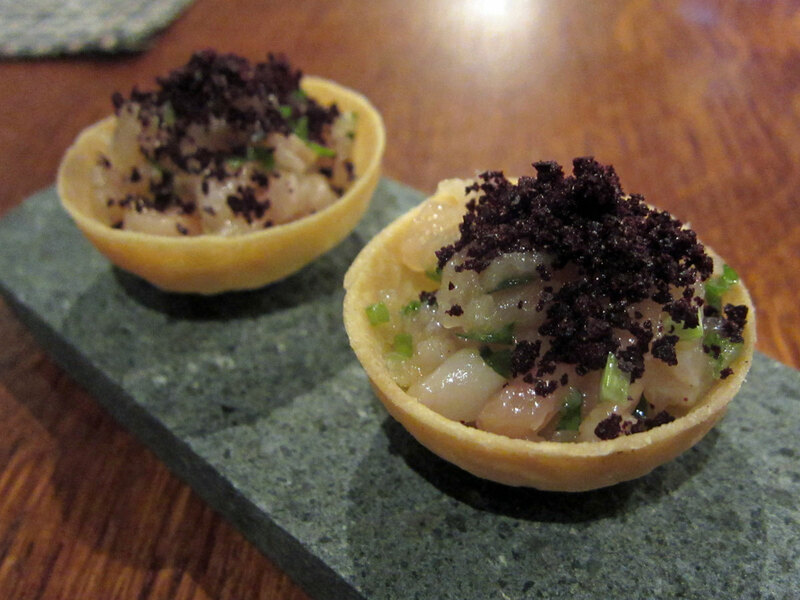 The ingredients were fresh and well-balanced, with the charr delicately smoked, and the vinegar from the picked radish complementing the saltiness of the salmon roe. While I am not a big fan of goat cheese, the next course of artichoke flesh and skin, crosnes, fresh goats cheese, farm shoots and tarragon oil had a very creamy goat cheese that I could quite happily eat. 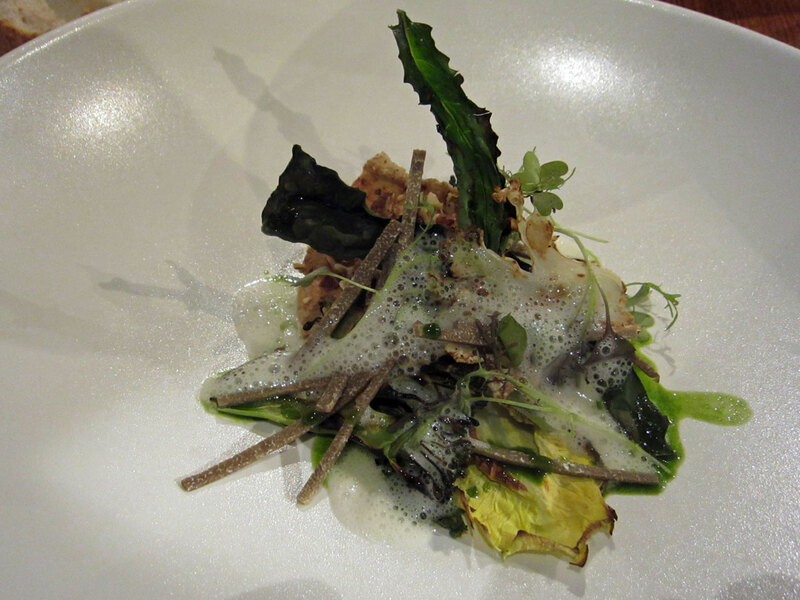 It worked well with the other ingredients, especially the light and refreshing artichoke flesh, and the combination of the various textures was impressive. Darcy made the remark that it was a dish that she would need the bread to mop the sauce. 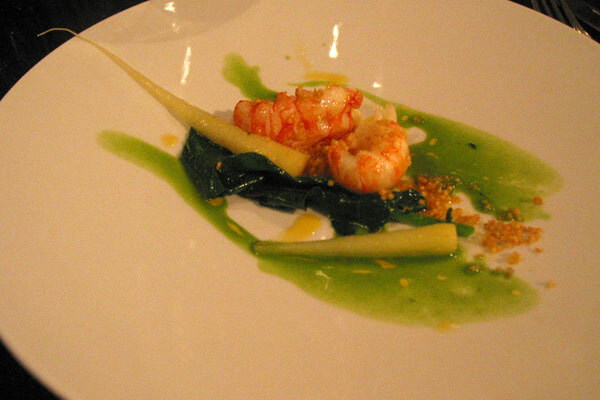 The next beautifully-presented dish was Dublin Bay prawns from Gairlock, wild cabbage, fragrant oil, chervil and toasted millet. The general consensus at the table was that sprinkling of salt on top was slightly heavy-handed. 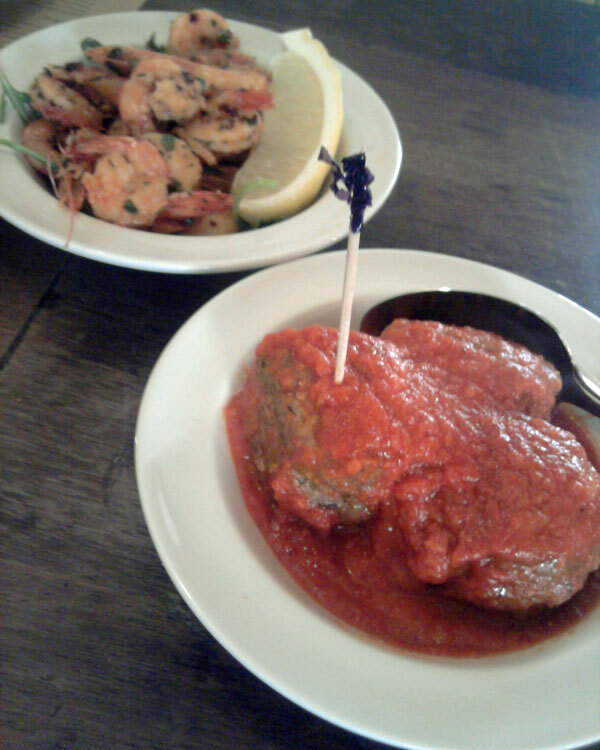 Personally the prawns were slightly overcooked and the toasted mullets a little too crunchy and flakey for my liking, but nevertheless the dish had an interesting contrast of textures. 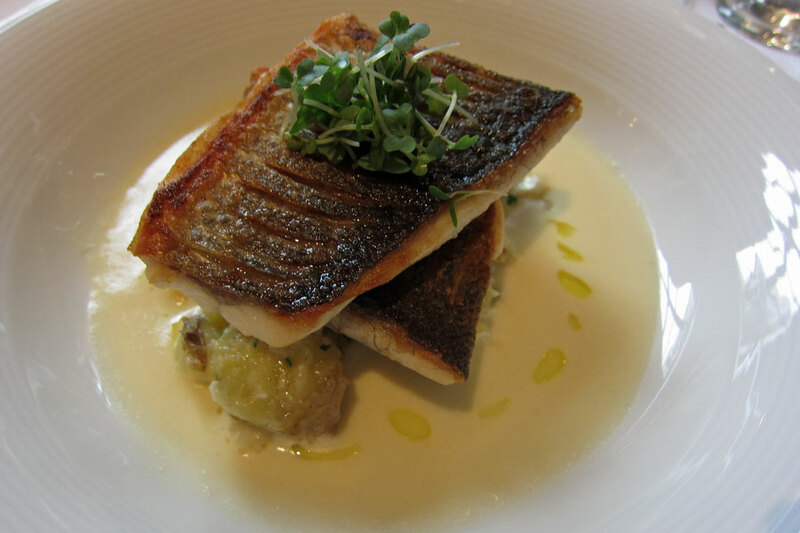 We were halfway through the menu and Russell commented that so far the meal was still missing the wow factor – the dishes were good but nothing that jumped out that he thought were exceptional. 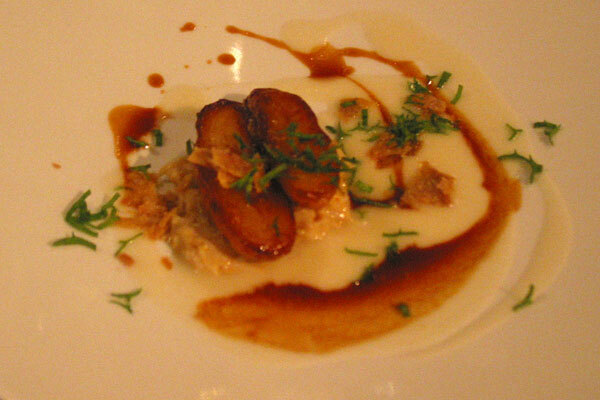 The 7th course was vintage potatoes cooked in chicken fat, flaky crab, onion weed and horseradish. Again we all found the dish too salty – it was a shame because the caramelised potatoes in the chicken fat were delicious and blended in well with the crabmeat, and it was spoilt by the saltiness of the sauce. There’s a limit between savoury and salty, and it seemed that the line was crossed in this case. Russell was not a cockles lover but he kept his open mind, secretly hoping that a restaurant like L’Enclume might change his opinion. The next course, skate ‘belly’ with bay cockles, purple azur baked in salt, coastal herbs and cider vinegar, unfortunately didn’t change his opinion on cockles. 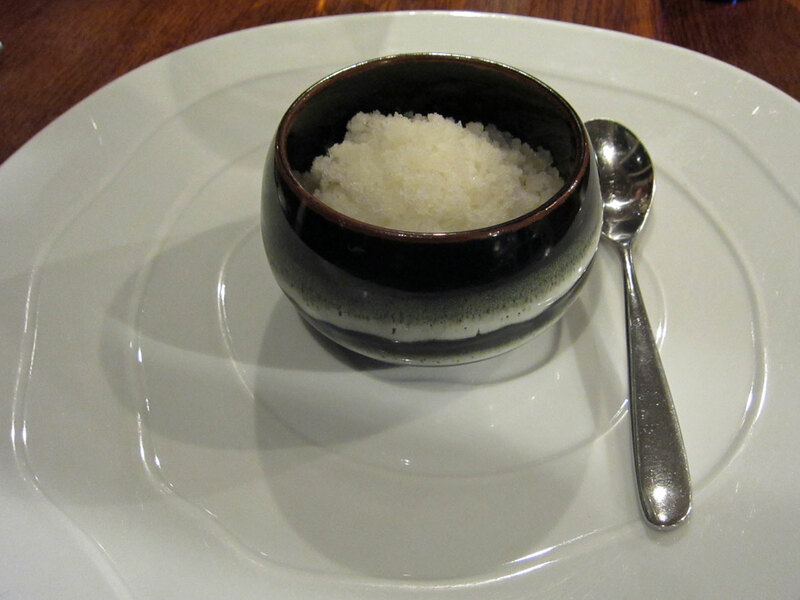 It was a shame that the dish seemed to have fallen flat on its face – the saltiness theme seemed to have just continued. 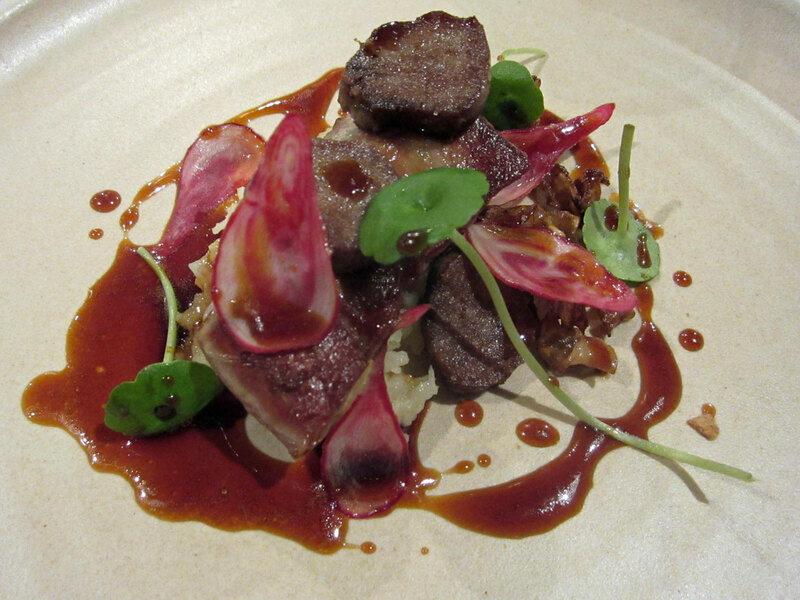 The last savoury course was beef rib from Lindal, celeriac, shallot, oxtail and alexanders. It was rich in flavour but the meat was not as tender as it could have been. In terms of presentation, it might have been more elegant if the celeriac actually wrapped round the beef rather than just putting them on top as if it’s like throwing a blanket over. 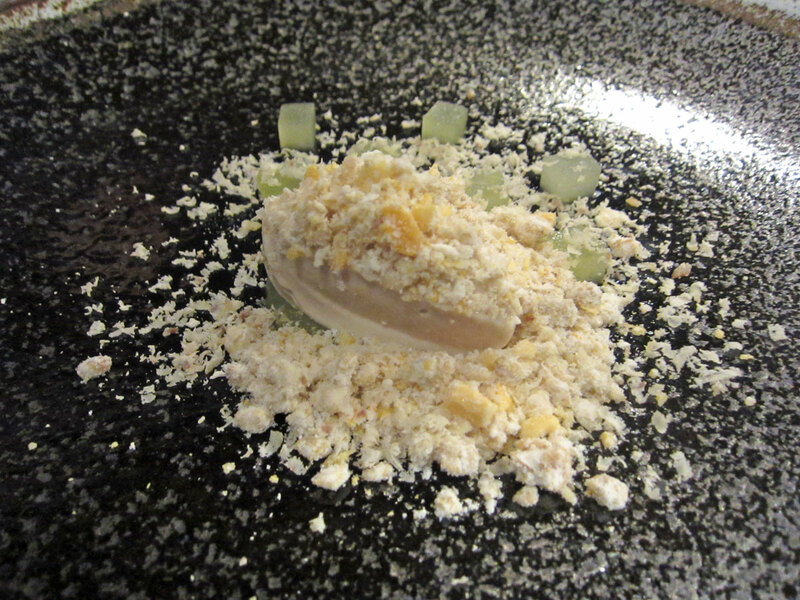 The pre-dessert / palate cleanser was iced celery and chestnuts, white chocolate and English truffle. Based on our sample of 4 people, it seemed that there’s a gender divide on the opinion of this dish. Darcy liked it a lot and she liked the taste that lingered in the mouth afterwards. 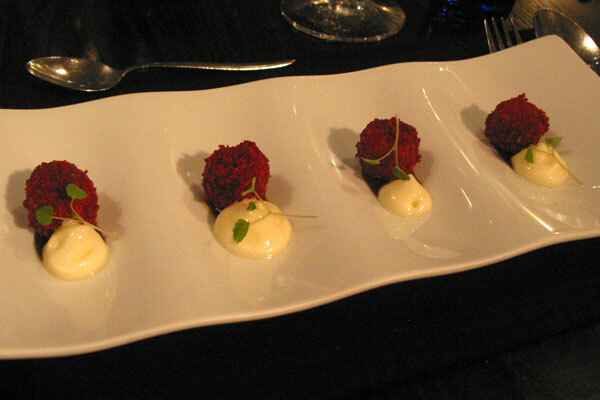 Bob and Russell did not like it and thought that it was more like a starter than a pre-dessert dish. 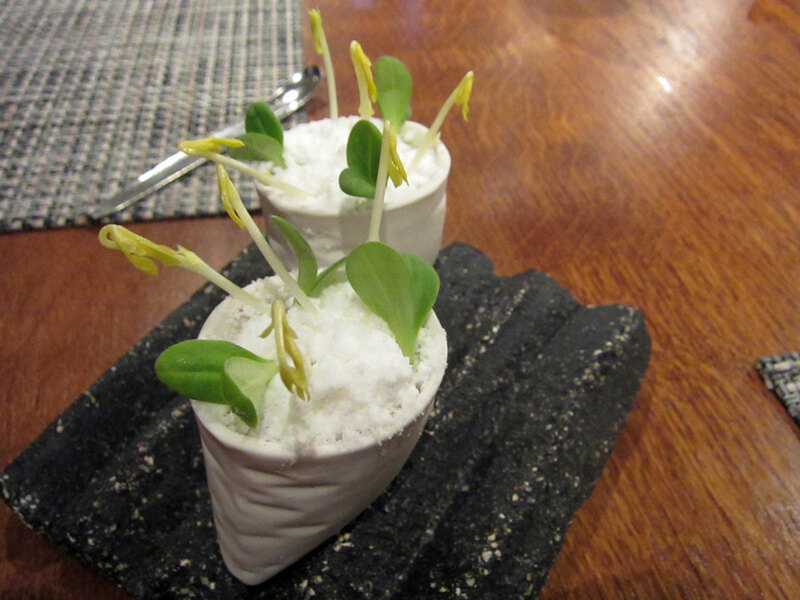 I thought the celery might have worked better as a granita – the aftertaste in the mouth was just too strong. The chestnut shavings went well with the white chocolate. The penultimate course was sea buckthorn, malt, Cumbrian dark beer, liquorice and blackberry powder. 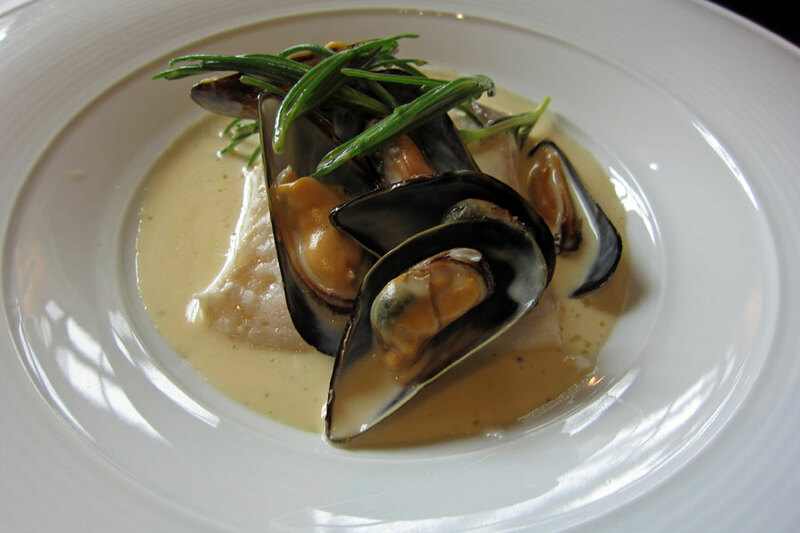 While it looked like an exciting dish, the actual taste was a little bit flat for us – maybe we were expecting an explosion of flavours that did not materialise. There was nothing unpleasant about this dish: I tried eating the different bits separately, and also tried eating the combined ingredients in one mouthful, neither method seemed to have made the mark in my mouth. The others all shared my view and felt rather disappointed with this dessert. 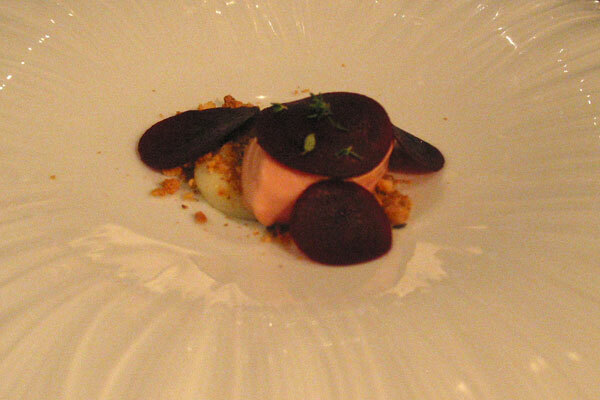 The fianl dish was apple sorbet, thyme custard, beetroot and cobnut crisp. 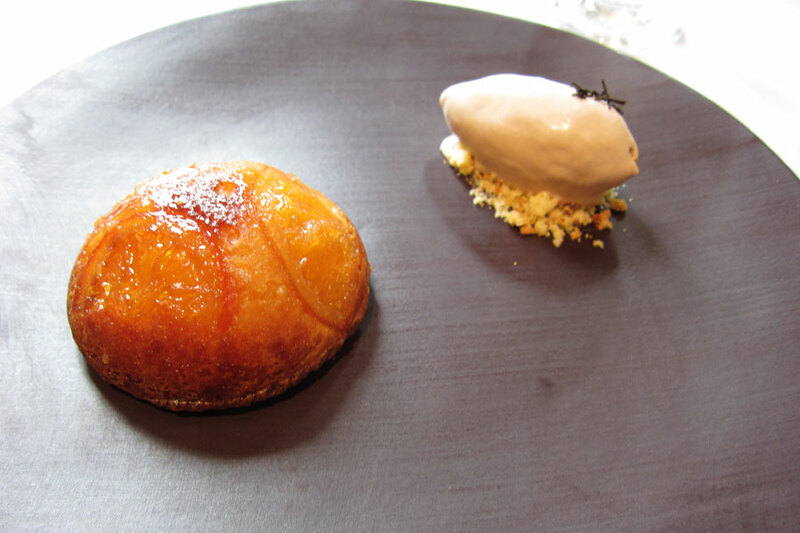 While it was nice to have the beetroot adding the texture to the tangy apple sorbet, it did nothing to satisfy Russell who, by this time, said that he’s still waiting for his desserts – in his mind, he’s not had any desserts yet. Darcy commented that she’d prefer this for breakfast. 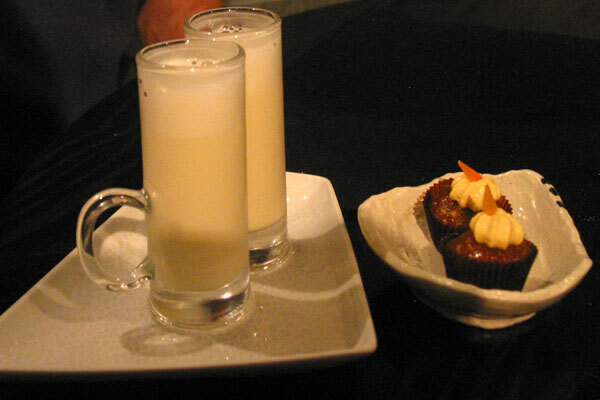 To finish the meal off, we were given the Douglas fir milkshake and Parkin cake. We weren’t too sure about the milkshare – the taste and texture just reminded me of some medicine (Russell, at this point, said “Milk of Magnesia”). Although some of the dishes, especially the desserts, were a little disappointing, on the whole we were impressed by the quality and freshness of the various ingredients. Also the meal was surprisingly light on the stomach – after 12 courses we actually felt good and happy, rather than having to carry our tummies out of the restaurant! 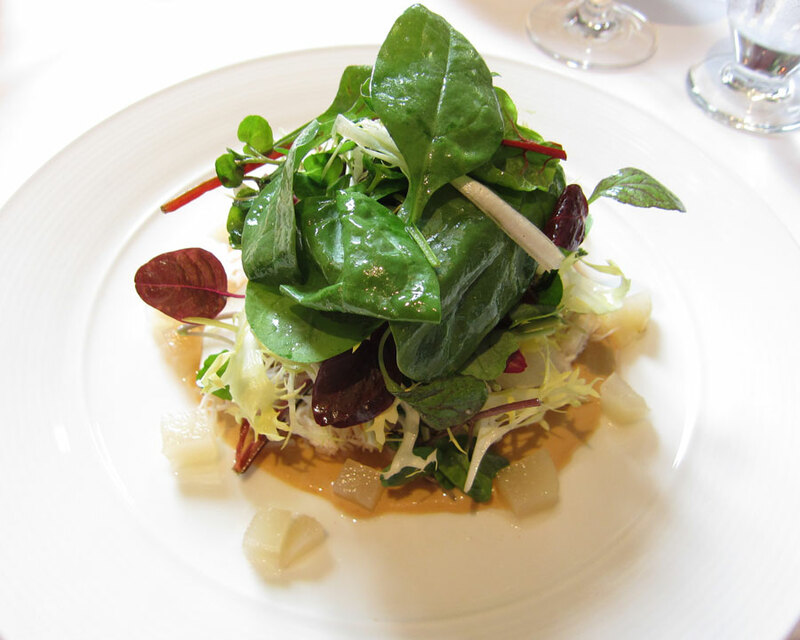 We would certainly go back again – if it’s just for the sake of having a “healthy” meal. Located inside the Langham Hotel, right in the middle of the bustling Tsim Sha Tsui district, you get a sense of tranquility as soon as you enter the restaurant. It’s spacious in there – plenty of room between tables. The decor is verging towards pure decadance, with burgundy and gold as the main theme of the colours, and velvet curtains and sculptures adding to the finishing touch of the place. Maybe the idea was to reflect the golden era of the Tang dynasty in Chinese history. I went there on the last day of my business trip in Hong Kong, just before I headed off to the airport to catch the plane back to London. It was also the opportunity to meet up with my friends Ken, Carol (and their baby Sigmund) and Joyce. And anything to prevent me having to stomach airline food afterwards was also a big plus. (1) Sauteed Prawns and Crab Roe with Golden-Fried Pork and Crab Meat Puffs, which had won the Gold with Distinction Award in the 2001 Best of the Best Culinary Award. 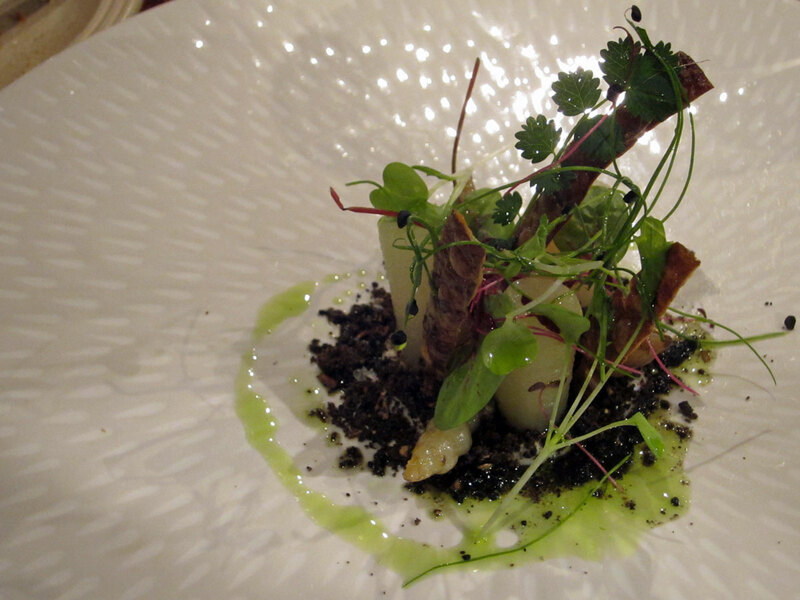 This dish was beautifully presented, and the taste was exquisite. 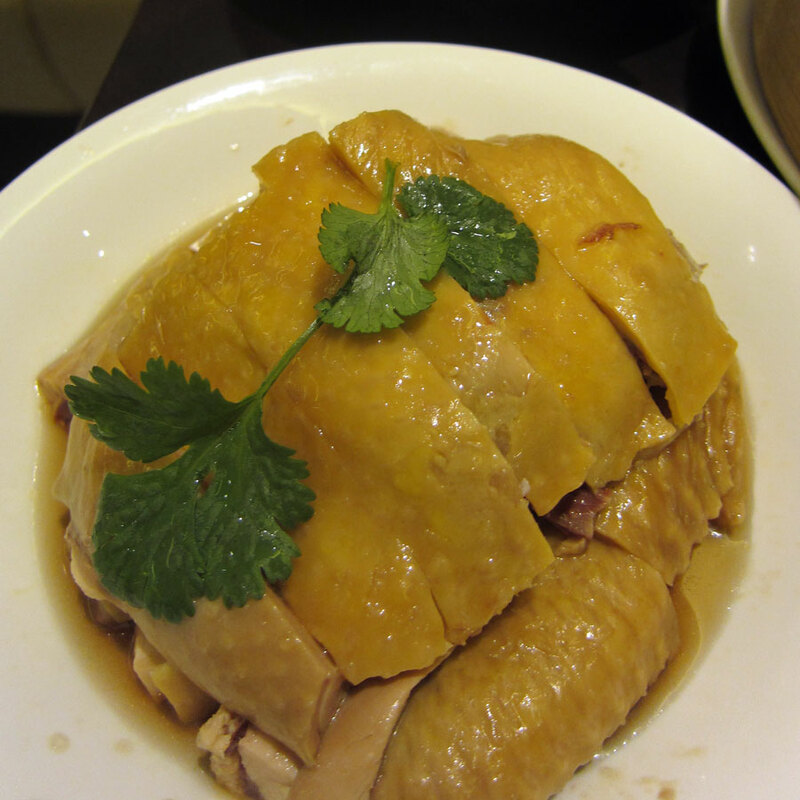 (2) Steamed Boneless Chicken with Yunnan Ham, Black Mushrooms and Vegetables – I normally can’t stand steamed chicken, but the ham and mushrooms augmented the otherwise very bland flavour of the chicken. (3) Stir-Fried Diced Beef with Mango, Walnuts, Celery and Red Pepper – The different textures from the beef, nuts and mango worked really well in this dish. 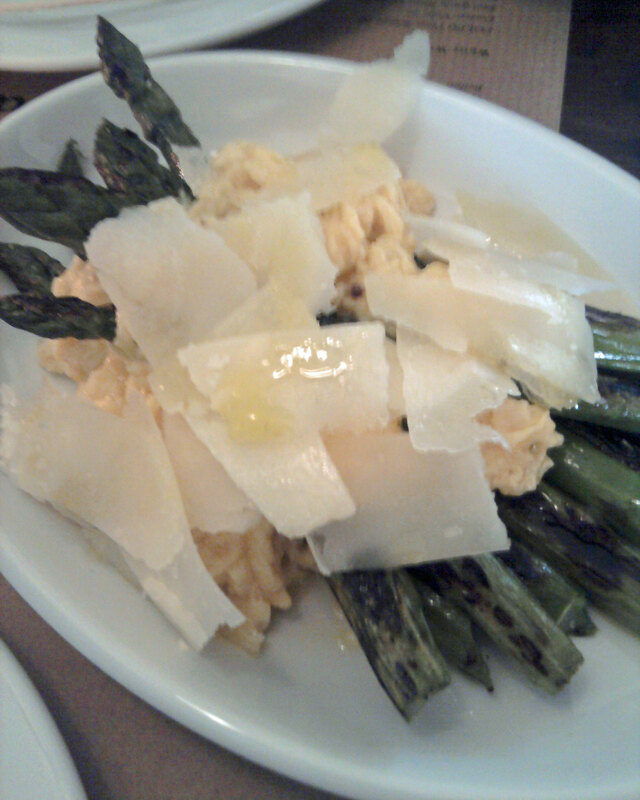 (4) Stewed Asparagus in Broth – nice young asparagus, and the broth had a full body of flavour…. the sauce did look as if there’s a bit too much cornstarch in it. (5) Baked Rice with Avocado and Diced Cod in Cream Sauce – this is how a Chinese dish should be: the colour, fragrance and taste all worked magic. I would have asked for seconds if there were any left in the dish. I would love to go back again and try a few other dishes. And if money is no object, then a few very expensive dishes would certainly be on the card! I don’t often hang out in Notting Hill, and so it is an effort for me to head to The Ledbury for dinner. However, sometimes good food comes at a price, and the price is for me to find the time and energy to venture to Notting Hill for this 2-Michelin starred restaurant headed by young chef Brett Graham. It’s a beautiful summer evening and it was a delight to find the decor light and airy, and with the large arch-windows the restaurant felt very spacious. The warm and yet informal welcome from the staff was also a breath of fresh air. However, things started to go wrong from that point: one of the menus had a duplicate page of main courses (that was quickly changed when we pointed out the mistake), and then our order of kir royale for the aperitif turned out to be without the “royale”. It didn’t matter as I was just as happy with champagne anyway. So the start was not promising. Fortunately, the quality of the food was more promising. The dishes with comments were the ones I ordered – I feel that I shouldn’t really comment on dishes that I only tasted a mouthful only. 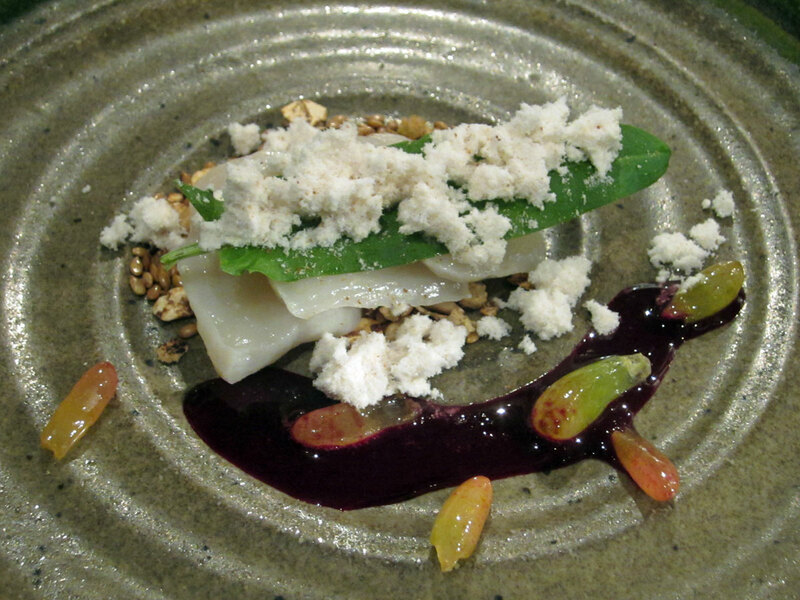 Still, I have the pictures and you can make up your own mind on these other dishes. 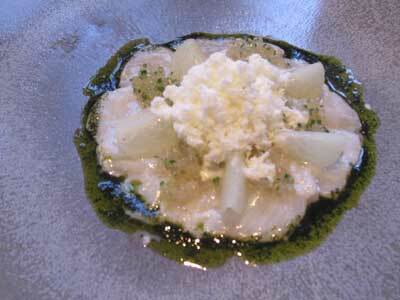 (1) Ceviche of Hand Dived Scallops with Seaweed and Herb Oil, Kohlrabi and Frozen Horseradish. The horseradish was a little too cold and the flavour too overpowering for the delicate taste and texture of the scallops. It’s refreshing enough but the aftertaste of the horseradish was just a little too much. 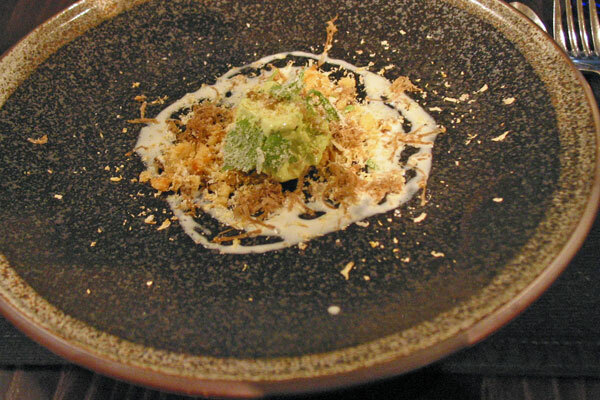 (2) Celeriac Baked in Ash with Wood Sorrel, Hazelnuts and a Kromeski of Wild Boar – one of the signature dishes of Brett Graham apparently. 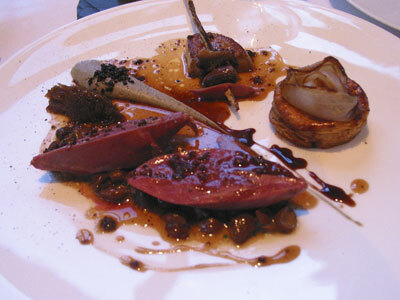 (4) Poached Breast and Confit Legs of Pigeon with Cevennes Onions, Foie Gras and Liquorice – the poached breast was tender and moist, and the other ingredients were bursting with flavour. The leg was presented to the table in a glass dome cover, and when the cover was lifted, the smoke and the aroma that followed was amazing. It was possibly one of the best main courses I have had for a very long time. A symphony of flavours. (5) Blueberry Panna-Cotta with Blueberry Sorbet – I like blueberries… this was refreshing but nothing special to write home about. (7) Chocolate Crèmeux with Walnut Ice Cream and Warm Chocolate Madeleines – A dessert that was beautifully presented, and the contrast in texture in this dish was amazing. It’s good to finish the meal on a high like this. 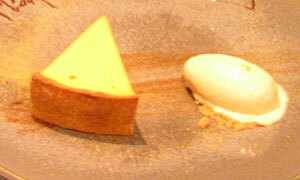 (8) Date and Vanilla Tart with Cardamom and Clementine Ice Cream – This was a special birthday treat. Nice one, and thank you for this! 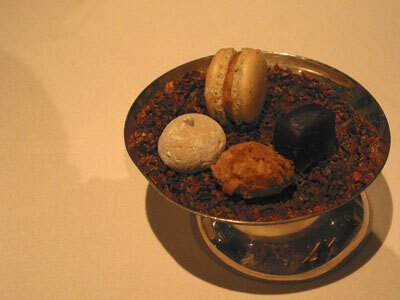 Finally, the petit-fours were presented on a plate filled with cacao nibs. Not the best idea as the cacao nibs got stuck to the macaroon. On the whole, the food was impressive – the mix of flavour worked well in most cases, and the contrast in texture in some of the dishes was interesting and memorable. One of the restaurants that I will definitely go back.